Last week, US television anchor Ben Swann slammed the mainstream media for its shoddy coverage of the situation in eastern Aleppo, pointing out that the so-called 'moderate rebels' there were actually aligned with terrorists. This week, Swann offered proof of that fact. The best part? He used the mainstream media's own reporting on the subject. Swann is a WGCL-TV Atlanta anchor who is well known for his coverage of controversial or under-reported stories, and has gained a reputation on a national level with his weekly segment called 'Reality Check'. This week, Swann offered proof ofa claim he made last week about the Aleppo fighters' less than moderate nature. Putting it bluntly, Swann said, the reality on the ground is that there are now only two groups fighting the Syrian government – Daesh (ISIS/ISIL) and al-Qaeda (aka Nusra Front, aka Jabhat Feteh al-Sham). As far as the 'moderate' Free Syrian Army is concerned, the journalist recalled that they haven't been a moderate force for over four years now. "The Free Syrian Army was formed in July of 2011, but within just one year, there were already widespread reports that al-Qaeda in Syria had infiltrated them," the journalist explained. In 2012, Swann had questioned President Obama directly about the US effort to arm forces in Syria which included members of al-Qaeda in their ranks. The president suggested at the time that he 'shared that concern', and that US efforts have been to provide non-lethal assistance to opposition groups that observed human rights. Unfortunately, the journalist noted, "one year later, in 2013, the CIA began delivering weapons to those Syrian rebels." The Washington Post reported on the deliveries, confirming that the State Department was also involved, supplying vehicles "and other gear." The Washington Post said at the time that this "flow of material" marked "a major escalation of the US role in Syria's civil war." "But things only got worse," Swann said, "because as the weapons were flowing in, so were jihadists, and by September of 2013, the London-based global defense consultancy group IHS Jane's reported that 10,000 of the estimated 100,000 insurgent fighters were linked to al-Qaeda. Another 30-35,000 belonged to powerful factions that were fighting for an Islamic State within a larger Middle East caliphate stretching from the Atlantic to the Indian Ocean." Astonishingly, Swann recalled, "that report showed at least a further 30,000 'moderates' belonging to groups that had an [Islamist] character. That means that by late 2013, only 25-30,000 so-called 'rebel' fighters were part of secular, nationalist groups; that's 25-30% of the rebel force that could be considered friendly to the West. [But] 70-75% of the forces against Assad, in 2013, were jihadists." "But that didn't stop the US from sending funding, and sending weapons," Swann added. "With some members of Congress, like Senator Rand Paul, insisting that these rebels were jihadists, by 2015 the US committed $500 million to find and train moderate rebels. Instead, by September, [there was] a major blow: 3,000 of the few remaining FSA fighters defected, and proclaimed their allegiance to ISIS. 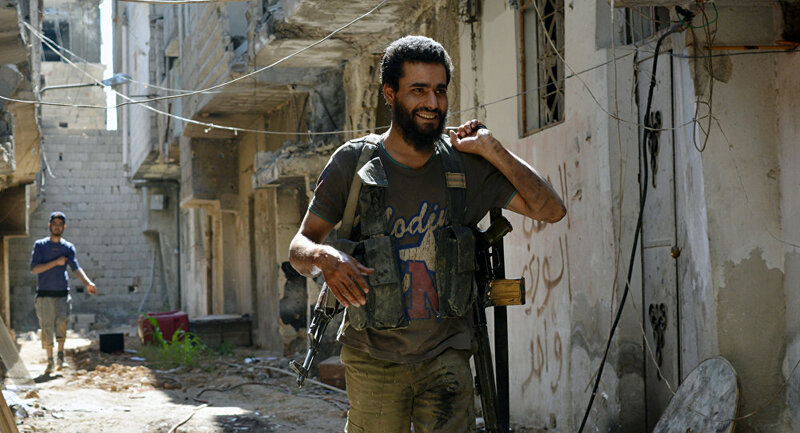 Those fighters belonged to multiple brigades that formed the conglomeration of the FSA." "Also in 2015, the Pentagon publically admitted that an additional 70 US-trained Syrian rebels surrendered a weapons stockpile to al-Nusra. Fighters from Division 30 surrendered to the al-Qaeda affiliate group after crossing into Syria over the Turkish border." "As for that $500 million 'moderate rebel' training program, that was halted only a week later, when the Pentagon admitted that it had only trained four or five fighters – not four hundred, or four thousand, four or five." By March 2015, Swann recalled, the International Business Times reported that "the moderate movement in Syria could be considered officially dead as of last week, when the last US-backed rebel faction, Harakat Hazzm, disbanded, its members joining extremist groups such as the Nusra Front, the al-Qaeda offshoot in the country. 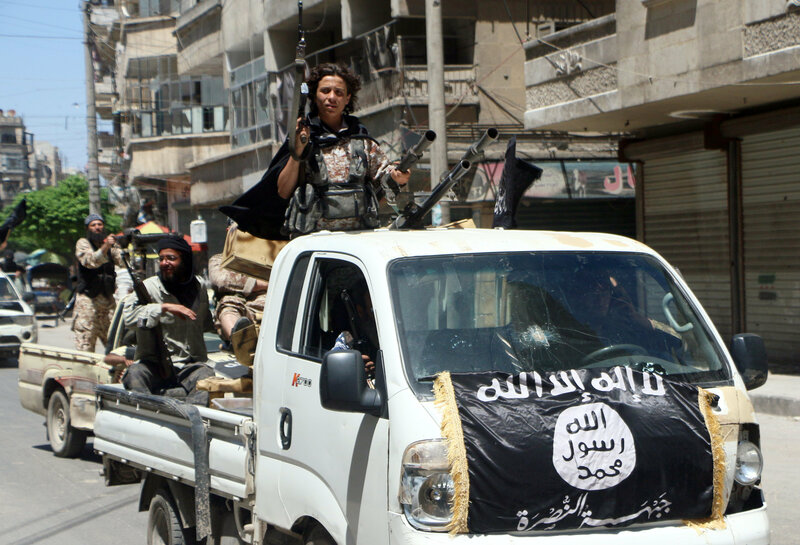 Some of the men joined a group called the Levant Front, a coalition of rebel militia that also has ties to al-Qaeda." "That was 2015," Swann stressed. "And yet, through 2016, weapons and funding from the West continued. In September of this year, 2016, the US delivered three thousand tons of weapons and ammo to fighters in Syria, including rocket launchers and anti-tank guided weapons systems." Ultimately, the journalist noted that "it is a fact that since 2012, those so-called 'moderate' rebels in Syria had been absorbed into al-Qaeda groups or pledged allegiance to ISIS. For the past year, the moderates have been gone. So when the media only calls these groups freedom fighters, [while] these fighters have pledged themselves to al-Qaeda, and to ISIS, make no mistake – they are not looking to make Syria free. They are looking to enslave it, as they have so many other places." Swann's exposé has exploded on social media, with users viewing his video through Facebook over 234,000 times and posting hundreds of comments; most thanked Swann for doing a job that the mainstream media seems to have shied away from.